Polisia [Полісся, Polissia; Polish: Polesie]. 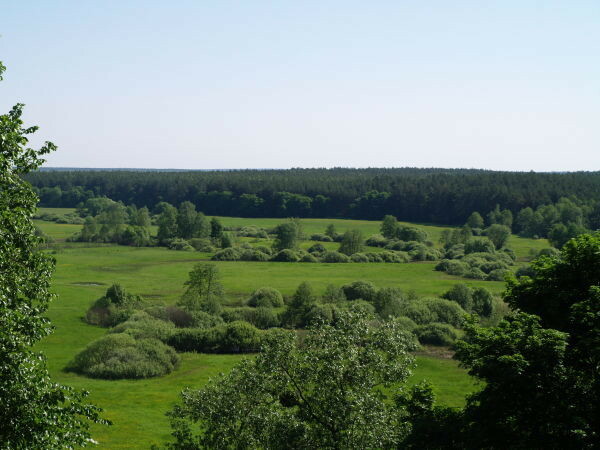 A physical-geographical region of lowlands and mixed forests lying between the Belarusian Upland to the north, the Volhynia-Kholm Upland and the Dnieper Upland to the south, the Buh River and Podlachia to the west, and the Dnieper Lowland to the east. Polisia is a large, flat lowland covered with glacial, fluvioglacial, and alluvial deposits. Low river gradients and shallow groundwater levels account for extensive marshes. Large areas are occupied by sands. The entire region is well forested. Boundaries. Under the broad definition Polisia covers a territory of over 200,000 sq km. Under the narrow definition, which excludes Chernihiv Polisia, Little Polisia, and Volodava Polisia, Polisia proper occupies about 160,000 sq km (see map). Unlike its northern boundary, Polisia's southern boundary is sharply defined. It extends from Kholm in the west through Volodymyr-Volynskyi, Lutsk, Rivne, and Korets. East of Korets the southern boundary shifts southward to Shepetivka and then continues through Zhytomyr to Kyiv. On the left bank of the Dnieper River the southern boundary of Chernihiv Polisia runs through Nizhyn, Komarivka, Baturyn, Krolevets, and Hlukhiv but is not as sharply defined. The Ukrainian-Belarusian ethnic border crosses Polisia from west to east approximately along the line Pruzhany–Bereza Kartuzka–Vyhonivske Lake, down the Bobryk River and along the Prypiat River to Mozyr, south to the Slovechna River and east along the Ukrainian-Belarusian border to the Dnieper River, and then north along the Dnieper River. 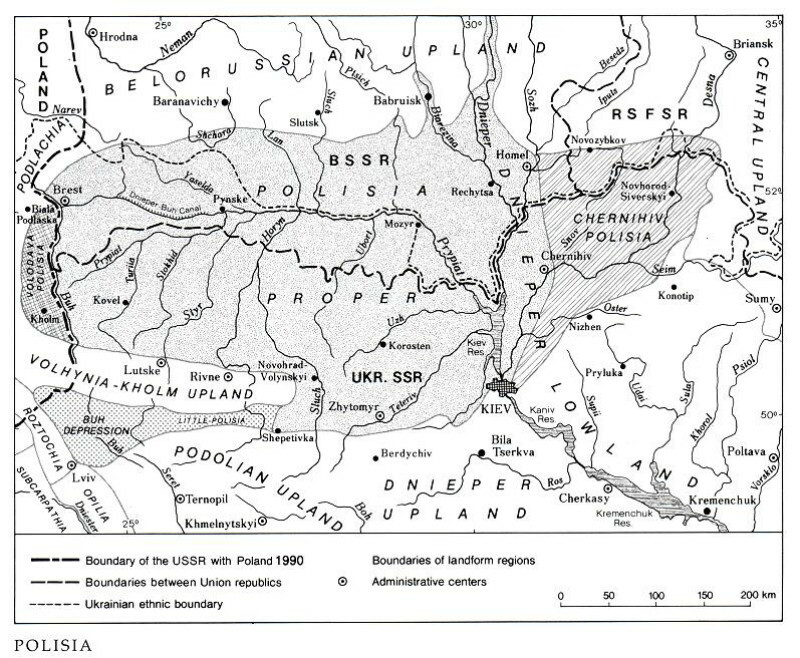 In the west the political-administrative border between Ukraine and Belarus does not correspond to the ethnic border, because the Soviet regime ceded the northwestern portion of Ukrainian ethnic territory (approximately 27,000 sq km) to the Belorussian Soviet Socialist Republic. Today Ukrainian Polisia is defined as Ukraine's forest belt (including Little Polisia and Chernihiv Polisia), which covers approximately 100,000 sq km. Ukrainian Polisia encompasses most of Volhynia oblast and Rivne oblast, about two-thirds of Zhytomyr oblast, the northern third of Kyiv oblast, and the Ukrainian-settled parts of Brest oblast (over one-half) and Homel oblast (about one-sixth) in Belarus. Geology and geomorphology. The oldest geostructural region of Polisia is the northwestern part of the Ukrainian Crystalline Shield, which is most prominent in Zhytomyr oblast. The region consists of Precambrian rocks, whereas the adjacent Ovruch Ridge is built mostly of quartzites and Proterozoic pyrophyllitic schists. The Precambrian foundation supports thin deposits from the Cretaceous and Paleocene periods here and there and a thin Quarternary overburden almost everywhere. The northwestern part of Polisia consists of the Brest Depression, which is filled to some 2,500 m with old Paleozoic, Jurassic, Cretaceous, and Tertiary sedimentaries, covered with a layer of Quarternary deposits. It is separated from the Prypiat Trough by the Polisia Arch, built on Precambrian and Devonian deposits. The arch runs northward toward the Belarusian Anticline and comes to the surface at several points. In earlier geological periods it separated two large troughs, the North Ukrainian from the Mazovian. Continental glaciers, which twice covered parts of Polisia, left stretches of ground and terminal moraines with erratics (boulders), thus smoothing out the preceding stream-eroded relief. Meltwaters carrying large quantities of sand and silt were joined by renewed small rivers that flowed to the north. The Styr River–Slovechna River spillway was formed along the edge of the glacier and carried the meltwaters to the Dnieper River. As the glacier receded to the Mozyr stage, the Prypiat River resumed its function and took up the waters of the Buh River, which was still blocked by the ice sheet to the northwest. Thus, the wide Old Buh–Prypiat spillway was formed. Glacial meltwaters and river waters washed away the moraines, which now occupy only small areas, and formed large lakes, because the flow of the Prypiat River was impaired by terminal moraines and the Ukrainian Crystalline Shield. The subsidence of Polisia's axis also led to widespread ponding. After the Prypiat River broke through the terminal moraines between Mozyr and Yurevychi, the Polisian lakes were partially drained, and turned mostly into swamps. But the Prypiat River lacked the power to remove the sands and alluviums that filled its valley, for the Buh River was captured by the Vistula River, the base level of erosion of which, with the emergence of the Baltic Sea, was lower than that of the Dnieper River. Consequently, large areas of Polisia, both valleys and interfluvial lowlands, remained covered with marshes and sands. The fluctuation of glacial and interglacial periods, the epeirogenic movements, such as the subsidence of Polisia's axis and the isostatic recovery and rise of its southern rim, and the alternation of erosion and accumulation resulted in the appearance of terraces in the river valleys. There are also small pockets of loess which belong to the Quaternary deposits. Generally Polisia is a uniform lowland plain, broken here and there by a few higher elevations, hills, or ridges of glacial, fluvioglacial, eolian, or denudational origin and by valleys. The axial part of Polisia is the broad, low floodplain that extends along both sides of the Prypiat River and its tributaries. Its relief does not exceed 5 m, and its width varies from 5 to 35 km. Flooded by meltwaters each spring, the bottomlands consist of thick layers of alluvial deposits, mud, sand, and peat. The river terraces are low there, rising to 7 m above the bottomlands, but to the south their relief increases to 15 m or more. 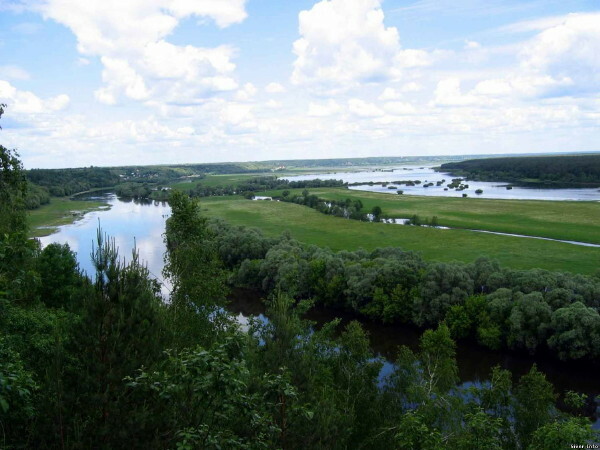 The alluvial-outwash deposits in Little Polisia between Shepetivka and Zhytomyr and along the lower Teteriv River, and the outwash plain along the Ubort River, are related to those alluvial-accumulation lowlands. The southern, elevated part of Polisia, as well as Kyiv Polisia, is less swampy. The swamps alternate with dry land, and the valleys are lightly incised. Those denudational plains are covered with a thin layer of outwash sands. In the southwest the relief of Volhynian Polisia is broken occasionally by chalk ridges. To the northeast the lowland is disrupted here and there by long and narrow ridges up to 60 m above the plain, including the Ovruch Ridge and Ozeriany Ridge. Large areas of Polisia are covered with sand dunes, wind-blown sands, and blowouts. In some places the sand dunes form chains or entire dune fields. On wide sandy plains and floodplains the sand dunes stand out as the highest points of relief and are called mountains by the local inhabitants. They were formed at the end of the Pleistocene Epoch, when large quantities of sand accumulated in front of the terminal moraines under conditions of a dry climate and prevailing easterly winds. Many of them were later partially covered by marshes and peat bogs. Sand dunes influence not only the landscape but also the river network and the way of life of the people. Lowland rivers can penetrate dune fields only with great difficulty. Because they are rarely flooded, dunes have long served as sites for settlement and roads. In more recent times the dunes were cleared for plowland and were quickly turned into a sandy wasteland by the wind. Climate. Polisia has a temperate continental climate with a warm and humid summer and a mild, cloudy winter. The Atlantic air mass dominates during the winter, and a modified continental air mass prevails in the summer. Continentality increases from west to east. The average annual temperature varies from 6.5°C to 7.5°C; the average January temperature decreases from –4°C in the west to –7°C in the east, and the minimum temperature drops from –32°C to –39°C. Summer temperatures are nearly the same: the average temperature is 18°C in the northwest and 19°C in the southeast. The frost-free period is 170 days in the northeast and 180 days in the southwest. The annual precipitation varies from 600 to 650 mm, although in any year it may vary from 300 to 950 mm. The maximum is obtained in June and July, when heavy rains and even downpours are frequent. The snow cover lasts from 90 to 100 days, and its depth varies from 15 cm in the west to 30 cm in the east. Fogs occur often—60 to 70 days per year, mostly from October to January. Water resources. Polisia is well supplied with water. It has a dense network of rivers, lakes, and marshes and large reserves of groundwater. Nearly all of Polisia lies within the Dnieper River drainage basin. Only a small western segment is drained by the Buh River, which flows into the Vistula River. The main artery of Polisia is the Prypiat River. Its system is asymmetric: the northern tributaries (the Pyna River, the Yaselda River, the Lan River, the Sluch River, and the Ptsich River) are short and small in volume, whereas the southern tributaries (the Turiia River, the Stokhid River, the Styr River, the Horyn River, the Stvyha River, the Ubort River, the Slovechna River, the Uzh River (Polisia), and the Zholon River) are mostly long and voluminous. 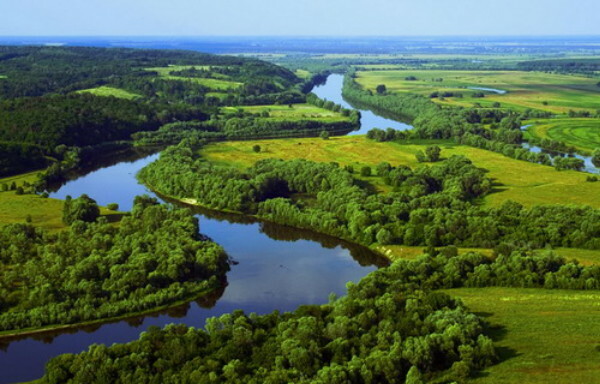 The Teteriv River and the Irpin River are direct tributaries of the Dnieper River. Polisia is rich in groundwater, which is found at various levels according to the geological structure. Quarternary deposits contain shallow groundwater. The best potable water in Kyiv Polisia is obtained from Paleocene deposits, and in Volhynia, from Cretaceous deposits. Polisia, especially its western part, contains more lakes (nearly 550) and ponds (nearly 1,000) than any other region of Ukraine. The largest lake in Polisia, Chervone Lake (area, 38.5 sq km; maximum depth, 9 m), formerly known as Kniazhe Lake and Zhyd Lake, belongs to Belarus. In Ukrainian Polisia the largest lakes are Svytiaz Lake (area, 27.5 sq km; maximum depth, 58 m) and Vyhonivske Lake (area, 26.5 sq km; depth, 2.7 m). About one-third of Polisia is covered with bogs and marshes. The flat terrain, the shallow depth of the groundwater, and the low gradient of the rivers account for the poor drainage. 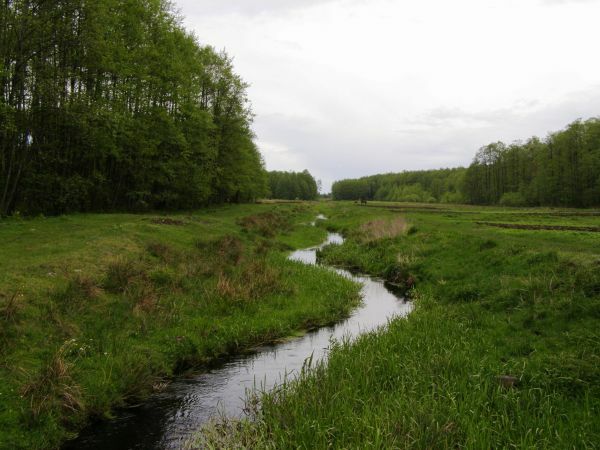 The wetlands are concentrated along the Prypiat River and the Horyn River. Soils. Nearly 70 percent of Polisia is covered with podzolic soils. Their natural fertility is low and proportional to their clay content. The least fertile sandy podzols are most common, the more fertile sandy loams cover the interfluves, and the most fertile loams cover small areas in Volhynian and Zhytomyr Polisia. Muck and bog soils occupy 15 percent of Polisia, mostly river valleys and depressions. With melioration they become the most fertile soils in Polisia. The most fertile natural soils are the rendzina soils, which occur on the chalk and marl deposits of Volhynian Polisia, the gray forest soils, which form ‘islands’ in the loessial loam deposits near Ovruch, Zhytomyr, Novohrad-Volynskyi, and Mozyr, and tiny areas of degraded chernozems on the border between Polisia and the forest-steppe. Vegetation. Polisia belongs to the mixed forest subzone of the East European broad-leaved forest zone. In the past the whole of Polisia was completely covered with forest and marshland. As a result of deforestation, mostly in the second half of the 19th century, and the growth of swamps, forests now occupy scarcely one-third of the land area. Plowland accounts for over one-quarter of the land, and hayfields, pastures, and meadowland for about one-fifth. Generally the forests alternate with the marshes. The most widespread tree is the pine (Pinus silvestris, 58 percent); it is followed by the oak (Quercus robur, 15 percent), birch (Betula verrucosa, 12 percent), and black alder (Alnus glutinosa). Small areas are occupied by the European aspen (Populus tremula), hornbeam (Carpinus betulus), and rare silver fir (Abies alba), only in northern and Volhynian Polisia. The wetlands flora displays pronounced differentiation. The greatest variety occurs on the lowland swamps enriched with mineral salts. The prevalent plants belong to the sedge complex, the hypnum mosses-sedge complex (some with willow and birch brush), and the cereal-sedge-hypnum mosses complex. The vegetation of the upland bogs is considerably poorer: it consists of various kinds of moss peat (notably sphagnum), scattered dwarf pines, and shrub containing heather, bilberry, and several grasses. A considerable area is occupied by meadows, either floodplains or deforested tracts. Fauna. Part of the Eurasian forest zone, Polisia contains a richer complex of fauna than the forest-steppe or the steppe of Ukraine. Among the forests of Polisia the richest fauna is found in the mixed forests, which contain the lynx, wolf, forest marten, chamois, fox, Eurasian red squirrel, weasel, ermine, wild boar, and brown bear and are visited by the elk (Alces alces, now very rare) from the marshy forest. The rivers support the valuable fur-bearing Old World beaver (in the nature preserves), European otter, and mink. Two other fur-bearing animals were successfully introduced, the muskrat and the nutria. The most common waterfowl species are wild ducks, snipes, black-headed gulls, mallards, bank swallows, and blue kingfishers. The rivers are full of various species of the carp family, such as the carp, gardon, chub, bream, roach, tench, and crucian carp, as well as the pike perch, sheatfish, loach, perch, and ruff. The eel from the Baltic Sea Basin has entered the Prypiat River system through canals. In the 17th century European bison and aurochs still inhabited Polisia; in the 18th century, the flying squirrel; and in the 19th century, numerous wolverines, bears, and elk. Overhunting, the impact of human activities, and the reduction of the natural habitat have contributed to the extinction of some species or their displacement to the north. History. Evidence of human habitation in Polisia dates back to the Upper Paleolithic Period (10,000–8000 BC). Considerably more evidence from the Mesolithic Period (8000–5000 BC) has been found on sand dunes along the rivers. In the 9th century Polisia was inhabited, according to the Primary Chronicle, by the following tribes: along both sides of the Buh River to the Yaselda River in the north lived the Dulibians (later known as the Volhynians); to the southeast and south of the Prypiat River were the Derevlianians (their main towns, Korosten and Ovruch); and to the north along the Prypiat River were the Drehovichians (main towns, Turiv and Mozyr). Thus the Yaselda–Prypiat line, which now forms the ethnic border between Ukrainians and Belarusians, marked off tribal territories long ago. In the 10th century Polisia became part of the Kyivan state. Turiv-Pynsk principality, which occupied the central part of Polisia, became part of Kyivan Rus’ at the end of the 10th century and regained independence at the beginning of the 12th. A century later it was divided into a number of small principalities, Pynsk, Turiv, Dorohobuzh, Peresopnytsia, Davyd-Horodok, and others, which were dominated alternately by Kyiv and Volhynia principalities. Eastern Polisia belonged to Kyiv principality, southwestern Polisia to Volodymyr-Volhynskyi principality, and the Brest land to Turiv-Pynsk principality and later to Volhynia principality. After the Mongol invasion almost the whole of Polisia became part of the Principality of Galicia-Volhynia. At the beginning of the 14th century northern and Prypiat Polisia were annexed by the Lithuanian grand duke Gediminas. After the collapse of the Galician-Volhynian state the whole of Polisia became part of Lithuania. In the middle of the 15th century most of Polisia was administered by the Olelkovych princes of Kyiv. From 1519 the Pynsk region belonged to Queen Bona, the wife of the Polish king Sigismund I the Old. She settled it with Polish peasants and petty gentry and made the first major attempt to drain the Polisian marshes. After the Union of Lublin (1569) Polisia was divided: the northern part remained in the Grand Duchy of Lithuania (all of Brest, part of Minsk, and slices of Navahrudak voivodeships), whereas the southern part was acquired by Poland (parts of Kyiv voivodeship and Volhynia voivodeship and the Kholm region). The major cities and the more populated parts of those territories, with the exception of Brest, were located beyond Polisia or on its periphery. Polisia gained importance in Ukraine's history during the Tatar conquest of the forest-steppe in the 13th century and the Crimean Tatar raids after the mid-15th century. A large proportion of the Ukrainian population of the forest-steppe sought refuge in Polisia, which was less vulnerable to attack. After the partitions of Poland the whole of Polisia was incorporated into the Russian Empire. The southern part was assigned to Volhynia gubernia and Kyiv gubernia (which formed a part of the Southwestern land), and the central and northern parts were incorporated into Hrodna and Minsk gubernias (part of the Western land). A large part of Ukrainian Polisia was thereby incorporated into gubernias with a Belarusian majority. Polisia was the most neglected and poorest part of Ukrainian territories within the Russian Empire. Conditions improved somewhat when the I. Zhilinsky expedition drained some parts of the region, although its work was confined mostly to state and nobles’ estates. Railroad transportation brought a significant improvement in Polisia's economy. According to the Peace Treaty of Brest-Litovsk the whole of Ukrainian Polisia became part of the Ukrainian National Republic. In 1917–18 the same Ukrainian national movement encompassed western Polisia and Podlachia. It was spearheaded by the Bluecoats Regiment and the Ukrainian administration. The Prosvita society, with its head office in Brest, organized 150 reading rooms. Ukrainian schools, co-operatives, and the newspaper Ridne slovo (1917–19) were established. The Peace Treaty of Riga resulted in the partition of Polisia between Poland and the USSR. Almost the whole of eastern Polisia, settled by Ukrainians, became part of the Ukrainian SSR. Only a small portion of it around Mozyr (6,400 sq km) was made part of the Belorussian SSR. Most of western Polisia, which was acquired by Poland, was formed into Polisia voivodeship, with its center in Brest; its southern part was joined to Volhynia voivodeship. Taking advantage of the low level of national consciousness among both Ukrainian and Belarusian Polisians, the Polish administration tried to Polonize them and to increase the Polish population in the region, which in 1920 accounted for under 5 percent of the total. Poland did not recognize Ukrainians or Belarusians in Polisia but set up the artificial category of ‘local people’ (tuteshni). In the 1931 census 62.4 percent of the inhabitants were registered as speakers of the ‘local language,’ 6.7 percent as Belarusian, and only 4.8 percent as Ukrainian. Moreover, the Ukrainian language in Polisia received no recognition. Polish was the only language taught in schools, and eventually it became the official language of the Orthodox church. No Ukrainian political, social, or cultural life was permitted: Ukrainian institutions, such as the Brest Prosvita and Ukrainian schools, were closed down. All Ukrainian activities were strictly controlled by the local administration, the police, and, in border counties, the military. The policy was enforced from 1932 by Voivode W. Biernacki-Kostek. In 1920–31 about 40,000 Poles, mostly colonists and military settlers, were resettled on former Russian nobles’ estates and state lands. In the years just before the Second World War the authorities attempted to Polonize and Catholicize the petty Orthodox gentry in Polisia. The ‘Polish Holland’ that was to be created on drained wetlands was to attract a new influx of Polish peasants, but the plan was defeated by the Polish general staff, who wanted to use Polisia as a buffer zone with the USSR. In September 1939 western Polisia was occupied by the Soviet Army. Only a small part of the former Polisia voivodeship (7,200 sq km) settled by Ukrainians was attached to the Ukrainian SSR; most of it (20,500 sq km) was assigned to the Belorussian SSR. The partition occurred according to the ‘will’ of the people's deputies of western Belarus, expressed by their convention in Białystok on 28 October 1939. The demands of rural delegations to oblast centers in Brest and Pynsk for union with the Ukrainian SSR were of no avail. Belarusian, or even Russian, was imposed as the language of instruction in schools, which the local population had started to Ukrainize. In the first months of the German occupation (summer 1941) Ukrainian life in Polisia revived, only to be stifled by the Nazis. Taking advantage of the swampy, wooded terrain the Ukrainian resistance became active, in the form of the Polisian Sich, which later became part of the Ukrainian Insurgent Army. Soviet partisan groups (see Soviet partisans in Ukraine, 1941–5) also operated in the region. After the Soviet Army reoccupied Polisia, the previous borders were renewed. The Ukrainians (approx 800,000), who live compactly in Brest oblast and on the southern fringe of Homel oblast, are officially considered Belarusian. Ukrainian has not been recognized in the government or schools and is not used in print. Ukrainians in Belarus are threatened with assimilation to the Belarusian culture in the rural areas and to the Russian culture in the cities. Population. The distribution of the population and the way of life were strongly affected by the geographical conditions in Polisia. Its inaccessible terrain protected the inhabitants from invasion and isolated them from foreign influences. Polisian people retained the ancient wooden architecture, the ancient dress with traces from the Princely era, and a rich store of folk customs and rites, traditions, and folklore, which are closely related in content and style with those of the rest of Ukraine. The people preserved many carols with ancient themes and old ritual folk songs, some of which have been adopted by the Belarusians. Since the end of the 19th century, however, the accelerated pace of change, improved transportation, the two world wars, and, especially, Soviet integration policies have forced out the ancient forms. Because of their isolation the inhabitants of Polisia never had a strong sense of national identity. They always felt and continue to feel that they are different from their neighbors the Poles, Russians, and Jews, and usually referred to themselves as ‘locals’ (tuteshni), ‘simple folk’ (prosti), or ‘Orthodox’ (pravoslavni). The names polishchuk and pynchuk, derived from place-names, were usually used by outsiders. The distinction between Ukrainian and Belarusian Polisians is not settled but can be drawn more or less along the linguistic border. The Polisians themselves recognize the difference in the hard and soft pronunciation of similar words (eg, the Ukrainian khodyty or khodity, and the Belarusian khadzity ‘to walk’) and distinguish Ukrainians from Belarusians without any difficulty (see Polisian dialects). Ukrainian Polisians called the Belarusians lytvyny or lytsvyny (Lithuanians) and sometimes hedyky or, pejoratively, lapatsony. The Belarusians, in turn, called the Ukrainians hiduni or hetuni. The Ukrainians of Polisia regarded themselves as different from the Belarusians and the Ukrainians of Volhynia and the Kyiv region. Their pilgrimages to the Kyivan Cave Monastery and especially to the Pochaiv Monastery in Volhynia contributed to that sense of affinity. There is no agreement on the demarcation of Ukrainians from Belarusians in Polisia. The Russian census of 1897 recognized the inhabitants of Brest and Kobryn counties, in Hrodna gubernia, as Ukrainians but regarded the people of Pynsk and Mozyr counties as Belarusians, although specialists on Polisia, such as Kostiantyn Mykhalchuk, Evfimii Karsky, D. Shendryk, and Mytrofan Dovnar-Zapolsky, clearly claimed that they were Ukrainian. The Soviet censuses of 1926 and 1959 took the border between the two republics as the Ukrainian-Belarusian demarcation line. The Polish censuses of 1921 and 1931 treated the nationality and language questions quite arbitrarily: the 1921 census, for example, ‘discovered’ a sizable Polish population in Kobryn county, which disappeared from the 1931 census by its being merged with the ‘locals.’ There were marked differences between the Ukrainians and Belarusians of Polisia in their folklore, dress, anthropological features, and psychology. The differences in their economic life and material culture were considerably smaller. Furthermore, the line of ethnic demarcation is not always sharp: there are transitional dialects as well as ‘islands’ of Belarusian settlers on Ukrainian territories. Nor is the Ukrainian population ethnically homogeneous: it is divided into a number of tribes distinguished by geographical conditions (history, and distance from developed Ukrainian lands and from Belarus). Those tribal differences have not been studied and are quickly disappearing. Because of its poverty Polisia did not attract foreigners. By the 1860s no more than 20 percent of the population consisted of Jews, Poles, Ukrainian-speaking Roman Catholics, and a few Russians, concentrated in the cities. Among the Ukrainians the petty gentry constituted a separate group. After the abolition of serfdom the landowners in southern Polisia sold off some of their land to Polish and German colonists. The proportion of Ukrainians in Ukrainian Polisia declined to 71 percent, the Jews made up 15 percent (the highest in all Ukrainian lands), the Poles and Roman Catholics, 7 percent, the Russians, 4 percent, and the Germans, 3 percent. As a result of the hostilities during 1914–20 and postwar adjustments the share of the Jewish population declined to 13 percent, and the German and Russian, to 2 percent each, whereas the Polish and Roman Catholic increased to 9 percent in western Polisia and declined in eastern Polisia, and the Ukrainian increased to 74 percent. As a result of the Second World War and the population exchange between the USSR and Germany, the Germans were no longer registered (in the 1959 census), the Jews declined to 2 percent, and the Poles, to 2.5 percent (only 1 percent in western and 3–4 percent in eastern Ukrainian Polisia), whereas the Russians increased to 5 percent, and the Ukrainians, to 90.5 percent. Belarusians numbered less than 0.4 percent in 1959. Polisia, especially its marshy part, is the least populated region of Ukraine. The population density in Ukrainian Polisia is 43 persons per sq km, and in rural areas as low as 25 (in 1987). In the early 1930s the population density in dry Polisia was 51 persons per sq km; in marshy Polisia it was 26. In dry Polisia plowland occupied 36 percent of the land area, hayfields and pastures, 18 percent, and forests, 33 percent. In marshy Polisia, by contrast, the corresponding figures were 18, 24, and 33 percent (see table). A unique pattern of temporary settlement arose in marshy, forested Polisia. With their arable land scattered on small ‘islands’ remote from the village, the farmers moved there for the spring fieldwork and the harvesting and lived there in primitive shelters. Haying required a stay of two to three weeks. The harvest was brought in when the marshes froze over, and the snow made sleigh transportation possible. Shepherds and fishermen spent even longer periods away from the village. As the population grew, groupings of seasonal shelters developed into permanent settlements. The population of Ukrainian Polisia grew rapidly in the decades before the First World War. From 1856 to 1914 it increased by 180 percent. The increase was a result not only of natural growth but also of the heavy influx of Ukrainians, Poles, Germans, and Belarusians, who bought up partitioned estates. At the same time nearly one-third of the forests were cleared for farming. After the First World War the population continued to grow rapidly: in western Polisia, despite some emigration overseas, it increased by 51 percent in 1921–31, as a result of a high rate of natural increase (2.6 percent), the return of wartime evacuees, and the influx of Polish colonists. During the Second World War the population dynamics in Polisia was the same as in other parts of Ukraine. By 1956 the population of Polisia had reached its 1939 level. Because jobs were scarce, people left Polisia in 1963–8. Polisia's net population increase amounted to only 35 percent of the natural increase. The population of Ukrainian Polisia was estimated at 4.5 million in 1970 and at almost 4.7 million in 1987. Polisia had and still has the lowest level of urbanization in Ukraine: in 1914 scarcely 10 percent of its population was urban, and in 1989, under 50 percent. In the same period the urbanization of Ukraine as a whole rose from 34 to 67 percent. Urban centers developed only in dry Polisia or on the dry ‘islands’ of marshy Polisia. Lacking large manufacturing enterprises, the cities of Polisia until the 1930s were dependent on trade, crafts, and administrative jobs. Jews comprised 60 percent of their population. Today all the larger cities have manufacturing enterprises. Economy. For centuries most inhabitants of Polisia lived off the forest and wetlands resources. Farming was important economically only in dry Polisia. The forests supported beekeeping and pitch-, potash-, and charcoal-making. Wood was the basic material for various implements, from plow to bastshoes. Flax, hemp, and wool were the raw materials for cloth-making, and clay was the basis for pottery. Even iron was smelted locally from bog ores, using charcoal. Forest products, such as furs, honey, potash, pitch, tar, and lumber, were exported. Agriculture in Polisia had a number of distinctive features: deep furrows were used to drain the soil, haystacks were raised on poles, and grain was dried on separate, high palings. In the second half of the 19th century the plow replaced the hooked plow (sokha) and wooden plow (ralo). In dry Polisia the tiny, scattered parcels of farmland began to be consolidated before 1914. After the First World War the process was accelerated in western Polisia. In eastern Polisia collectivization resulted in consolidation on a large scale. The main crops in Polisia were rye (41 percent of the sown area), potatoes (16 percent), oats (13 percent), buckwheat (6 percent), barley (6 percent), and millet (3 percent). Among technical crops the most important was flax; hemp and hops were less important. The grain yields averaged only 7–10 centners per ha and the potato, 70–100. Forest products were Polisia's most valuable exports. Lumber became an important export at the end of the 18th century, when the canals connecting Polisia to the Baltic Sea were completed, and even more so when the railways were built in the 1880s. Polisia was one of the poorest agrarian regions of Ukraine. Although its peasants had more land than the peasants of the forest-steppe, the soil was poor, and the yields low. Farming, especially in wet Polisia, was primitive and backward and had little connection with the markets. It produced a small surplus in cattle and forest products (mushrooms, berries). Home-manufactured goods were seldom marketed, except for clay pottery from Horodnytsia and baskets from Khliaby. The forest industry provided many jobs. Other industries were poorly developed and along with trade were controlled by foreigners. Many peasants emigrated to Asia (from eastern Polisia) or to the United States of America (from western Polisia). The inflow of Polish colonists into western Polisia under the Polish regime only added to the hardships of the Ukrainian peasants. Industry is still relatively weak in Polisia, although it has grown considerably since the 1960s. Most of it is involved in processing local agricultural, forest, and mineral raw materials. The food industry accounts for the largest share of the gross production. Its main branches include alcohol distilling, butter- and cheese-making (Kovel, Radomyshl, Olevske), meat packing (Kovel, Brest, Pynsk, Kobryn, Sarny), fruit canning (Ovruch, Zhytomyr), flour milling, and brewing industry. The lumber industry, woodworking industry, furniture industry, and paper industry are widespread. Their main plants are in Pynsk, Kobryn, Kovel, Kyvertsi, Tsuman, Orzhiv, and Kostopil. Prefabricated houses are manufactured in Kostopil and Irpin. Furniture factories are found in Malyn (Zhytomyr oblast), Zhytomyr (see Zhytomyr Furniture Manufacturing Complex), Kostopil, and Brest; paper plants, in Malyn (Zhytomyr oblast), Korostyshiv, Myropil, Poninka, Chyzhivka, Slavuta, and Mokvyn; wood-chemicals plants, in Korosten, Ovruch, and Slavuta; and a match factory, in Pynsk. Light industry in Polisia includes the linen manufacturing complex in Zhytomyr (the largest in the former USSR; see Zhytomyr Linen Manufacturing Complex) and a similar one in Rivne (see Rivne Linen Complex); smaller linen plants in Kovel, Korostyshiv, Novohrad-Volynskyi, Yemilchyne, and Ovruch; sewing factories in Zhytomyr, Korosten, Novohrad-Volynskyi, Rivne, Lutsk, Kovel, Brest, Kobryn, and Pynsk; cotton-textiles factories in Brest and Korostyshiv; and leather footwear factories in Zhytomyr, Lutsk, and Brest. The machine building and metalworking industry have been established in Polisia since the 1960s. Their more important enterprises include agricultural machinery plants in Kovel, Rozhyshche, Rivne, Zdolbuniv, and Novohrad-Volynskyi; the tractor factory at Olevsk; the automobile plant in Lutsk; the electrotechnical factories in Brest, Lutsk, and Rivne; the instrument-making factories in Lutsk and Zhytomyr; the chemical machinery and highway machinery plants in Korosten; and a boat-building plant in Pynsk. The chemical industry is also new to Polisia. Its representative enterprises are the fertilizer plant in Rivne, the petroleum refinery in Mozyr, the petrochemical refinery and the synthetic-fiber factory in Zhytomyr, the plastics plants in Lutsk and Mozyr, and the paint and dye factories in Pynsk. Various building materials are mined and processed in Polisia: pink granites and black labradorites, kaolin (for ceramics, tiles) and quartzites (for glass), and basalts on the Horyn River. Bricks and tiles are manufactured from clay in many towns, and cement from marl in Zdolbuniv. Because of the abundance of kaolin the porcelain and china industry in Polisia is more developed than in other regions of Ukraine. Their major enterprises are located in Baranivka, Horodnytsia, Korosten, and Dovbysh. The glass industry, with a large plant in Zhytomyr, is based on local deposits of quartzite sands. Energy for Polisia’s industries comes from imported coal and oil (some from Rechytsa, in Belarusian Polisia) and from the unified electric grid, which encompasses some power plants in Polisia: the Chornobyl (at Prypiat) and the Rivne (at Kuznetsovsk) atomic power stations and the thermal power stations in Zhytomyr, Novohrad-Volynskyi, Korosten, Bereza, and Mozyr. Polisia has the lowest density of roads and railways in all Ukraine. In 1880–5 a railway line from Homel to Brest through Kalinkavichy and Pynsk was built. In 1902 a second parallel line through southern Polisia, Kyiv–Korosten–Sarny–Kovel–Kholm, was added. Of the two perpendicular lines, which connect Volhynia with the Belarusian Upland, the first was built in 1885 from Baranavichy through Lunynets and Sarny to Rivne, the other during the First World War from Zhlobin through Kalinkavichy, Mozyr, Korosten, and Zhytomyr to Berdychiv and Shepetivka. During the Soviet period the lines Chernihiv–Ovruch and Fastiv–Zhytomyr–Novohrad-Volynskyi were built. Many narrow-gauge lines, built mostly during the First World War, are used for moving timber and cordwood. The major railway junctions are Brest, Lunynets, Kalinkavichy, Zhytomyr, Korosten, Sarny, and Kovel. Most all-weather roads and highways in Polisia were built during the Soviet period. The main east–west highways are the Kyiv–Brest highway (Kyiv–Zhytomyr–Novohrad-Volynskyi–Rivne–Lutsk–Kovel–Brest) and the Brest–Homel highway through Pynsk and Kalinkavichy. The major north–south highways are the Kyiv–Chernihiv–Homel stretch of the Odesa–Saint Petersburg highway, which essentially bypasses Polisia in the east, and the Zhytomyr–Korosten–Ovruch–Mozyr–Babruisk stretch of the Vinnytsia–Minsk highway. An all-weather road connects Rivne with Pynsk through Sarny and Stolyn, and a perpendicular all-weather road from Kholm to Kyiv follows the railway line through Kovel, Sarny, Korosten, and Malyn (Zhytomyr oblast). The waterways in Polisia are an important part of the transportation network. Navigable routes include the Dnieper River, the Prypiat River (and its tributaries), the Styr River, and the Horyn River, and the Dnieper-Buh Canal. Many other rivers are used for rafting timber.